The tug Paradox on the right towing the corvette R-32 on the left. 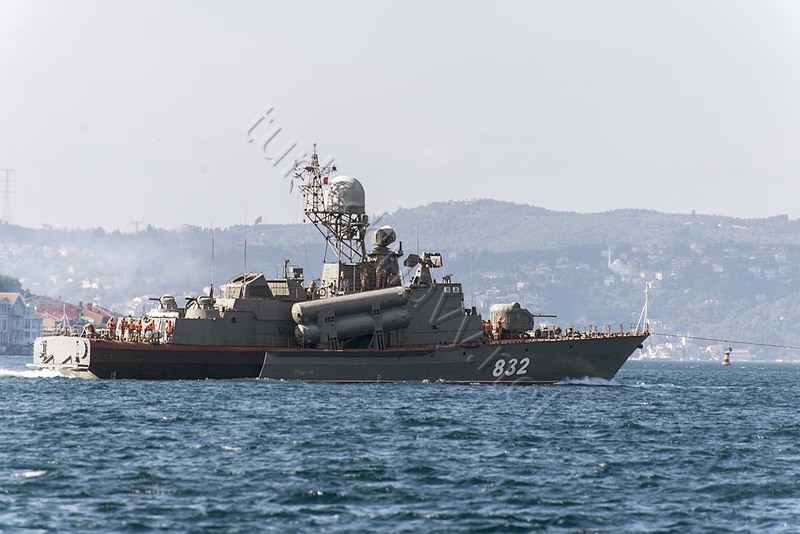 The Tarantul class corvette, R-32 being towed. The tow line is clearly visible at the right of the photo. The smoke coming from the stack indicates working machinery. The Tarantul class corvette, R-32, the latest addition to the Egyptian Navy, being towed. The tow line is clearly visible at the right of the photo. 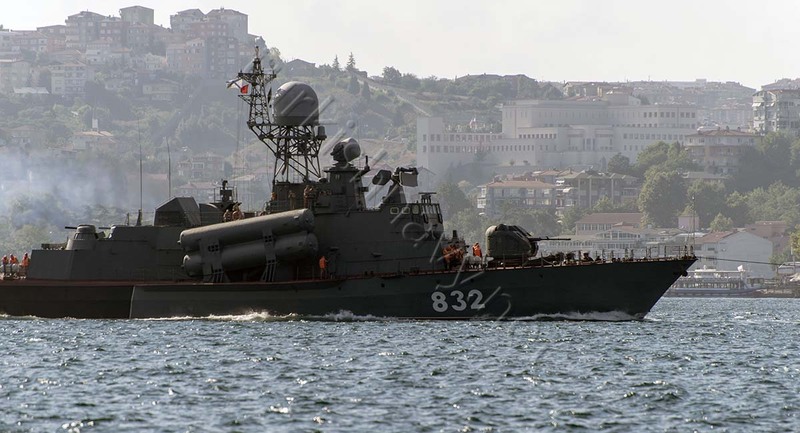 On 19 August 2015, the Russian tug SB-921 Paradoks, towed the Tarantul class missile corvette R-32 to Russia. The corvette made headlines when she was handed over to Egyptian Navy on 10 August 2015. According to official statements the handing of the corvette was seen as a confirmation of the cooperation and strategic partnership between Egypt and Russia and within the framework of joint military cooperation between the two countries’ armed forces. When she was towed the corvette R-32 was observed hoisting St Andrews, the ensign of Russian Navy instead of the Egyptian one. Also the crew appeared to be Russian. The reason, why the corvette was being towed after 5 days Egypt announced it had taken delivery of the vessel, is not obvious from the outside. The smoke coming out of the stack of the corvette indicates that either the main machinery or the generators for electricity are working. If the main machinery is not faulty the problem may be in the reduction gear, shafts, propellers or rudders. This incident shows that any foreign navy should check about the condition of the warship before accepting it from Russian Navy. I was wondering what the heck was going on. I observed this while I was driving near Cnakkale strait ! Could not observe the whole thing. Thank you, now the puzzle is solved. They were followed I believe by a Rapucha class landing ship. There is an Alligator coming your way. The article distorted everything from the beginning to the end. The first is not “Tarantula”, a class of “Firefly.” The second said it was faulty power unit? He is in tow, so what? 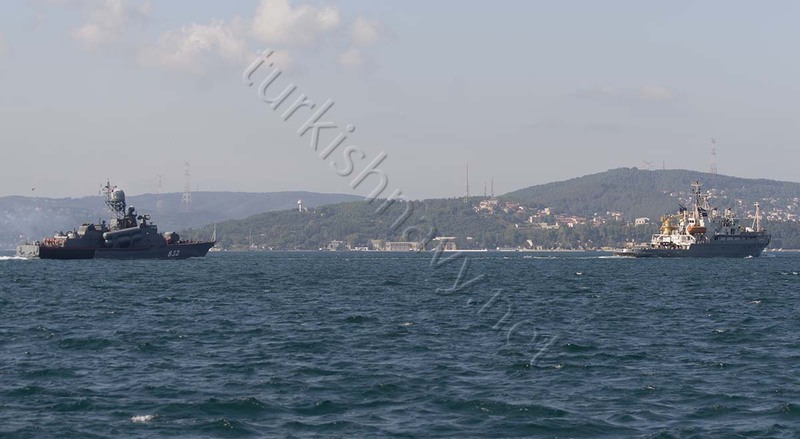 This is an old trick of the Black Sea Fleet, if there is no need for the power plant to save moto use tow. Personally, I have seen up to 5 boats “train” for the trawler to the area of the shooting.